Gerbils have a lot of energy and need to engage in entertaining activities to gain the kind of physical and mental stimulation that will help ensure their health and happiness. Although they are small, there are many safe toys and products that can make playtime fun. Unlike specific species of hamster that prefer a solitary life, gerbils are social by nature. To provide continuous entertainment for your pet gerbil, get him a friend. According the American Society for the Prevention of Cruelty to Animals, gerbil siblings make the best pairing. If that's not an option, it's best to introduce two unrelated gerbils to each other when they are young to help ensure they take to each other. However, don't keep males together with females unless you are trying to breed them. Gerbils are similar to hamsters in that they love to run on exercise wheels designed for domestic rodents. Providing your gerbil with a hamster wheel will allow him to exercise at his will, helping to keep him both entertained and healthy. To prevent injury, choose a wheel with a solid running platform, and not one with bars, so his feet and tail will remain protected. 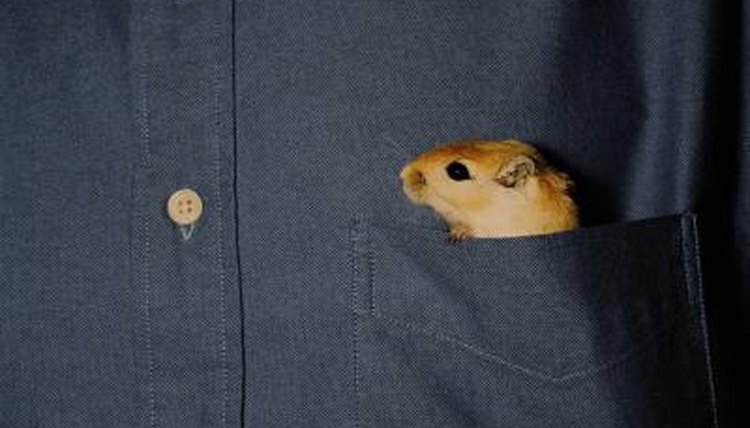 Gerbils instinctively like to burrow as they would if they were in the wild. In the wild, they would most likely be digging through dirt, but their domestic habitats can be constructed with various bedding materials they can tunnel under. Rodent bedding made from recycled newspapers, timothy hay or even torn up paper towels can be used to provide your gerbil with hours of digging entertainment. As part of the rodent family, gerbils have an instinctual need to gnaw on things in order to keep their teeth from growing too long. According to the American Gerbil Society, an untreated four by four of lumber can keep your gerbil entertained by serving as a necessary chew toy. The agency suggests drilling some large holes through the wood to provide a more interesting design and then using the extra solid pieces as additional toys.